You are here: Wilderness Camping » Camping Gear » The Price of Performance – Is Expensive Camping Gear Worth It? Price is an objective monetary number; it is neither high nor low, but an absolute figure. Value is the perceived functional worth of the piece of equipment relative to its price. This value is subjective to individual users, coloured by how a particular piece of equipment fits in functionally and emotionally with one’s needs. This is often where differences of opinion become apparent, as the sum total of the perceived value is based on many individual factors. When it comes to gear choice, it can be difficult to assign relative importance to qualitative features such as comfort, ease of use, and aesthetic. Speed, weight, duration, tensile strength, etc., are much easier define and use as justification when purchasing. Depending on how you’re going to use that piece of camping gear, and how critical it is within your over-all system, all points are valid and should be given thorough consideration. Equipment choice is very subjective. 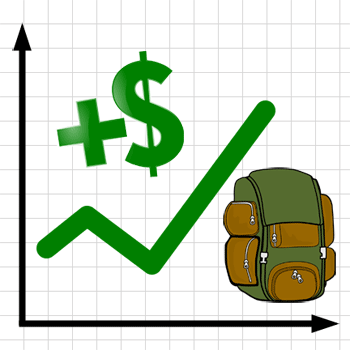 For me, a hundred dollar increase in the price of a backpack to save a pound is not personally worth it. I’m very hard on packs and prefer one made with heavier material – the extra weight just doesn’t matter that much to me and the way I travel. In fact, I once ripped (several times) a brand new “light(er) weight” pack on its first outing; for me a heavy, durable pack is actually worth more. An UL backpacker may gasp in horror with my assessment and decision making process, but he or she wouldn’t know that much of my hiking is done on game trails or no trails, being snagged or poked by branches on a constant basis. I also frequently use my pack as a seat or a backrest, testing the fabric and seams in ways they weren’t designed for, and that for me, an ultralight cuben fiber pack would be an expensive liability. Conversely, things I am willing to pay top dollar for others wouldn’t, as we have such different objectives and methods. Opinions on gear forums and in user reviews are often varied and usually biased. If a particular feature doesn’t apply to that person, then the product is too expensive, why would anyone pay that much? Duration 0.7 hrs. – 53 days 3.5 hrs. In this particular instance, there are many features that even individually I would pay for. Duration and waterproofness are important to me, and while the more expensive one is brighter, that’s one of the least important features for me, but it seems to be a major influencing factor for many. I also believe many people would pay twice the price for half the weight. In my opinion, this is what it comes down to – gear choice is personal. If you like it, find it useful, and want it, then pay for it and don’t listen to anyone else.